Associate Professor Joanne Fielding, Emma Solly. 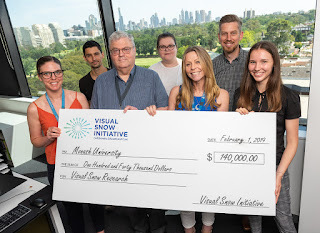 Thanks to a donation from the US-based non-profit Visual Snow Initiative (VSI), Monash University Department of Neuroscience researchers, Associate Professor Joanne Fielding and Professor Owen White, will conduct Australia’s first exploration of an emerging neurological syndrome called Visual Snow. Many young people are affected by the hallmark symptom of constant and dynamic “snow” in the entire field of vision. One minute you see the world clearly and in an instant, without warning, a life is changed forever. It can be a 24/7 battle because it never goes away with the eyes opened or closed. Others are born with the condition, and many don’t realize how abnormal their vision really is. A new dilemma can occur for those seeking a diagnosis or treatment. Eye tests almost always come back normal because Visual Snow is not an eye disorder but a brain malfunction. Because Visual Snow manifests itself in the eyes, it often leaves both patients and physicians in limbo, uncertain of where to go next for a diagnosis. This also makes it difficult to estimate how many people are affected. While the cause is unknown, Visual Snow is believed to be a neurological problem whereby the brain incorrectly processes visual information sent from the eye. Migraines, floaters, auras and other neurological symptoms are also associated with the syndrome, which can significantly diminish the quality of life for those affected. The Australian team is one of the very few research groups globally to conduct translational research into the condition, which has only been identified and characterized in the past 20 years. Monash University’s research into Visual Snow will include evidence of the neurological basis which includes behavioral studies, oculomotor assessments, electrophysiology studies and neuro-imaging. The Visual Snow Initiative has a global team of researchers, physicians and neuroscientists collaborating and has set up a global fund for ongoing research.